SHOULD investment analysts have to pick a sector with good earnings growth, they need look no further than the export-oriented furniture manufacturers. In the recently concluded corporate results reporting season, many furniture makers announced a leap in net profit while the loss-making ones returned to the black. And in view of their improved earnings, some furniture makers are declaring generous dividends. Latitude Tree Holdings Bhd (fundamental: 2.5; valuation: 1.8) saw its net profit for the second quarter ended Dec 31, 2014, jump to RM27.39 million, up 44% from the previous corresponding period, while revenue edged up 2.5% to RM189.1 million. At Lii Hen Industries Bhd (fundamental: 2.5; valuation: 2.4), net profit for the fourth quarter ended Dec 31, 2014, surged 126% from a year ago to RM8.3 million while revenue climbed 23% to RM102.98 million. HeveaBoard Bhd (fundamental: 1.3; valuation: 2.4) saw its net profit increase nearly 36% year on year to RM30.5 million in the financial year ended Dec 31, 2014. Earnings per share grew to 30.65 sen from 24.84 sen. 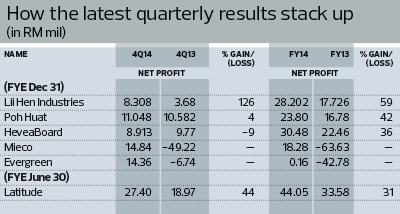 However, its fourth quarter net profit fell 8.8% from the previous corresponding period to RM8.9 million. The rise in the quarterly net profit of Poh Huat Resources Holdings Bhd (fundamental: 2.1; valuation: 2.4) was smaller — up 4.4% to RM11.05 million. Its full-year net profit climbed 43% to RM23.8 million or 22.3 sen per share from 15.67 sen per share. It has declared a dividend of eight sen per share for FY2014 compared with five sen the year before. Both Evergreen Fibreboard Bhd and Mieco Chipboard Bhd turned the corner in FY2014. Evergreen achieved a net profit of RM14.4 million in 4QFY2014 compared with a net loss of RM6.7 million in the previous corresponding period. However, net profit for the full year was barely RM161,000 due to the losses earlier in the year. Investment analysts who track the furniture makers are not surprised at the upward trajectory in their earnings because the sector is an obvious beneficiary of a weaker ringgit against the US dollar and a fast recovering US economy. 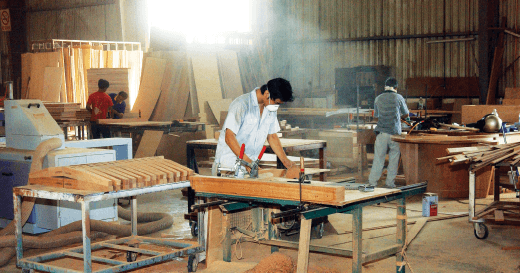 The revenue of furniture makers is in US dollars while their cost is in ringgit, which is the double impact of a weak local currency, says CIMB Research analyst Marcus Chan. Late last year, the ringgit weakened to around 3.50 against the US dollar as the greenback grew stronger against the currencies of most emerging markets, thanks to an improvement in US economic growth. The ringgit has dropped even further to between 3.60 and 3.62 since. CIMB IB has forecast the ringgit to be around 3.60 on average and depreciate to 3.70 by year-end. TA Securities, which initiated coverage of Poh Huat after its full-year results, says if the ringgit declines to 3.85 against the US dollar, it forecasts the company’s FY2015 net profit and revenue to reach RM32.4 million and RM429.1 million respectively. “Although the company may have to pass on some of the forex gains as customers are likely to ask for discounts should the local currency stay weak for an extended period, this will still improve the competitiveness of its exports versus those of its competitors,” the research house says in a report. It believes favourable conditions in the US, including a recovery in the housing sector, lower unemployment rate, better economic outlook and falling commodity prices, will boost demand for furniture. The impressive earnings growth in the quarter ended Dec 31, 2014, is evidence of a recovery in the furniture industry, which has been in the doldrums since the US subprime mortgage crisis. Nonetheless, given the industry’s cyclical nature, some quarters remain cautious about furniture stocks, which have skyrocketed to multi-year highs. They doubt that the earnings growth momentum can be sustained after the forex gains dissipate. Ang recalls that in the past, local furniture makers did not perform well in comparison with their competitors from China and Taiwan. “Many of them even closed down because they were not competitive in design and efficiency,” he says. A dealer who declined to be named concurs, saying he would not advise his clients to park their money in furniture stocks just yet. “At the moment, long calls are limited as I am still worried about the economy. I dare not advise my clients to buy furniture stocks yet as these may be in cyclical play,” he tells The Edge.